Electronic ignition, computer-controlled fuel injection and air intake, alarm systems, radar, rear back-up cameras, GPS, stereo sound systems, Bluetooth tire pressure monitor, hands-free telephone, automatic headlight directors, drowsy driver detectors, collision avoidance, anti-lock brakes, fuel efficiency management, air bag deployment, self-parking and even self-driving features are now or soon will be standard features in automobiles. Mac McGregor and Barney hit upon a lot of these items - some explicitly, some implicitly - in this 1973 installment of "Mac's Service Shop" found in Popular Electronics magazine. Amazingly impressive devices and systems are fermenting in the minds of engineers and scientists today that will begin appearing in new car models a decade or decades from now. While I am duly impressed, I would gladly trade my 2011 Jeep Patriot for a nicely restored 1960s or 1970s pick'em-up truck*. I'll add the desired newfangled gizmos myself. RCA's version of car of the future, showing where solid-state electronics will be used. "Mac," Barney said to his boss working at the bench beside him, "what will cars be like twenty years from now?" Mac finished a delicate job of desoldering an i-f can from a printed circuit board before he answered, "No one knows for sure what those cars will look like or how they will be powered, but this much is certain: they will involve a lot more electronics than cars do today. Several months ago the American big three automobile manufacturers forecast that $5 billion annually might be spent on automotive electronics by 1980, and European manufacturers are talking about 12 percent of car costs going for electronics by 1982." "That's not hay you're talking about," Barney reminded him. "I was just reading that last year we spent $49 billion on autos and parts. Then we spent another $41 billion on gas and oil, repairs, insurance, and other charges. That made a neat total of $90 billion, or about 11% of our after-tax income. Only food, about 17%, and housing, about 13%, get a larger share of the American's after-tax dollar. To ice the cake, consumer sales of autos and parts in the first three months of this year were up 20% over the same three months of 1972. Some think an unprecedented fifteen million cars and trucks may be sold this year." "That's all the more reason why a young fellow like you, who expects to make his living from electronics, would do well to take a keen interest in this automotive-electronic field that is just starting to boom. You may be able to get yourself a piece of the action." "Why are car people discovering electronics now?" Barney asked. "In the past we've only received pin money from the auto people. Radio, headlamp dimmer, voltage regulator, sequential turn signals, alternator diodes - that was about it." "There are several hard-headed reasons. In the past, auto design was dominated by mechanical engineers who were very reluctant to allow outsiders to play a part in designing the car. But now they need electronic help to meet government-dictated deadlines for reducing pollution. Only solid-state compactness can provide room in the already crowded car for new safety and comfort equipment. Modem high-speed, heavy-traffic driving imposes demands on the average driver that exceed the limitations of his unaided senses and reaction time; only lightning-fast electronics can amplify those senses and stretch time for him. Space exploration, by fully demonstrating the reliability, precision, and space-saving of electronics under extreme conditions has destroyed many arguments against such use in the car, and plummeting solid-state costs have undercut others. Finally, the ranks of automotive engineers, historically trained to think in terms of mechanics. are being infiltrated by space age electronics engineers. Their influence promises to snowball." "How about getting out your crystal ball and showing me some of the coming electronic applications to cars?" Numbered callouts show locations of components in Chrysler's electronic security system. New and Future Applications. "Okay. First I'll switch the crystal ball to 'local' and talk about applications right at hand. Electronic ignition is one. Chrysler engineers estimate 15% of the cars on the road have one or more plugs misfiring, increasing hydrocarbon emission 300 to 1000 per cent. Their electronic ignition system, now standard on all their cars, is designed to prevent such misfiring. A toothed reluctor and a magnetic pickup coil replace conventional breaker points, cam, and 'condenser' inside the distributor. Each time a reluctor tooth passes the pole piece of the pickup coil, this induces a pulse in the coil that causes a switching transistor to interrupt the primary current of the induction coil, just as happened when the old breaker points were nudged open by the cam. The rest of the ignition operation is normal, but notice there are no points and no earn to wear and pit and corrode so as to degrade the spark and change the timing. Ignition time set at the factory remains adjusted as long as the distributor is left alone. "Car theft is another challenge electronics is meeting. Almost a million cars were stolen in 1971, twice as many as were stolen six years previously. Starting this year Chrysler offers a new security system built right into the car's basic electrical system. An attempt to force open the passenger, trunk, or engine compartment or an unauthorized attempt to start the car causes the horn to start beeping and the headlights, tail lights, and parking lights to flash on and off. The same system serves as an occupant distress alarm and provides instant protective locking. When an emergency button on the instrument panel is pushed, all doors are instantly locked, the hood latch is blocked, and the visual and audible alarm signals start and run for three minutes and then stop, but the doors remain locked. This feature is considered essential because as unoccupied-car protection becomes better, the frustrated thief may feel the best way to steal a car is to take the key away from the driver; so chance of assault is mounting. Naturally, details of the system are not broadcast, but the heart is a well-concealed control box equipped with IC's, transistors, resistors, power relay, and a capacitor. This box receives a message from any sensor, interprets the message, decides which of several courses of action is most appropriate, and initiates the proper action. 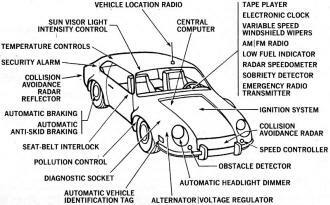 "But with more than 55,000 killed and five million injured on the highways annually automobile safety commands a high priority on the services of electrons, and they promise to meet the challenge. To help avoid collisions we already have in production electronic anti-skid brakes, sequential turn signals, engine speed limiters, intermittent windshield wipers, and headlamp dimmers. If radars can be built cheaply enough, there are innumerable anti-collision uses for them on cars. Bendix has developed and Ford is testing an adaptive speed-control system that uses a CW Doppler radar and a computer that computes range and range-change-rate between one car and another in front. Connected to the accelerator and brakes, it automatically slows a car when it is getting too close to the car in front; and if a marked deceleration is noted in the car ahead, the brakes of the trailing car are applied. To prevent false readings from cars in adjacent lanes, the Doppler beam is restricted to about 4 degrees, which is lane width at 200 to 250 feet. Responders on the rears of cars return the sensing signals in some systems. "Cheap radars will be used in the rear and sides of the car to warn the driver of other cars approaching from behind in adjacent lane blind spots or of objects behind him when he is backing. Here a wide beam, up to 180 degrees, will be used. In tests Bendix has detected a one-pound coffee can at 15 feet. Other collision-avoiding electronic devices of the future include a light-amplifying TV-type viewer for better vision in fog and rain, a decelerator indicator that warns the driver behind you the instant you ease up on the accelerator, a highway condition sensor that gives notice of ice forming on the pavement, and an audible warning when you drift out of your lane. 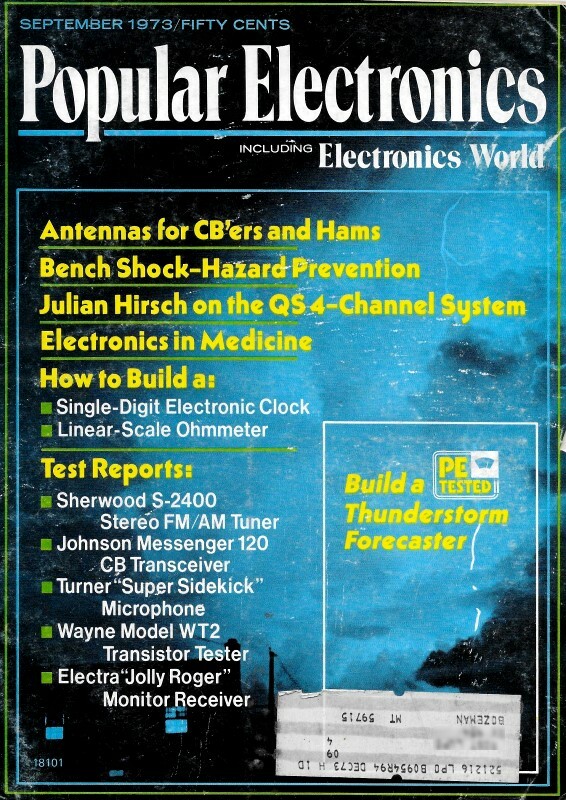 Four new solid-state devices - the Gunn oscillator, the LSA diode, the IMPATT diode, and the TRAPATT diode - promise to make available the cheaper radar." "Yeah, and I've read that a radar trigger can yield the extra fraction of a second needed to prevent explosive accelerometer-triggered airbag inflation in an accident," Barney offered. Computer-Controlled Autos. "Right," Mac agreed. "You probably noticed several of the electronic devices mentioned require separate signal processing and control units. Trevor Jones, head of GM's Electronic Control Systems Group, considers this duplication wasteful and is doing something about it. That 'something' is the Alpha series of computer-controlled experimental autos. An automobile computer such as that in Alpha-1 should, according to Jones, be capable of performing a number of functions common in a universal control system: add, subtract, remember things, perform go/no-go logic, and switch. Time sharing in such a computer can justify its cost by bringing the cost of add-on functions down to a low level. 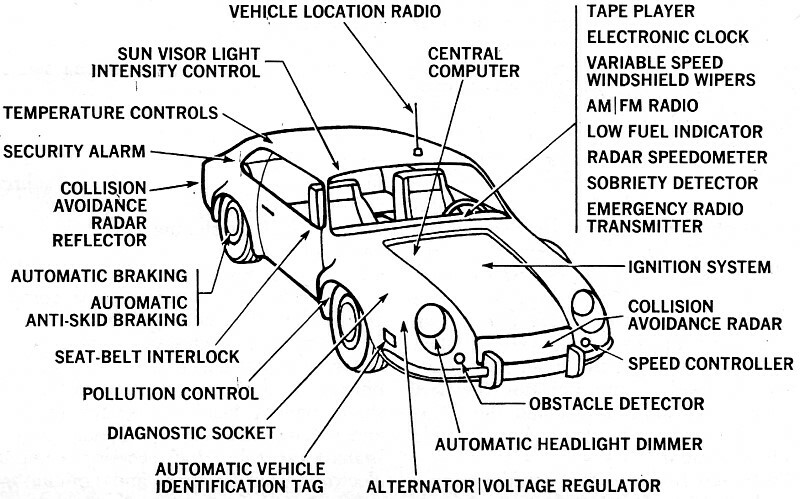 "For example, in Alpha-1 the computer controls an electronic ignition lock, a seat belt warning, a 'Phytester,' or drunken driver tester, a digital gas gauge, a digital speedometer, a digital clock, automatic windshield wipers, headlamp switching, heater and air-conditioning, turn signals, anti-skid braking control, a fuel economy computer, electronic fuel injection and ignition, gear shifting, emission monitoring and control, locking of the doors at 5 mph, and air-bag firing. In addition, many systems and subsystems are constantly monitored, and any trouble produces a display that tells the driver what is wrong and what to do about it. "The digital logic speed is high enough to make control operations appear simultaneous. For example, quantity of fuel injected and spark timing are calculated for each cycle, but free intervals remain between these calculations for use by other functions. Priorities are assigned to all functions, and in an emergency the computer works from the top of the list so that the most essential override the less important ones. Air-bag firing, for example, overrides everything else. "The proliferation of electronic components, however, cannot be permitted to add to the mile-long rat's nest of wire used in present cars. The answer being built into Alpha-2 and under development by all three major manufacturers and some independent firms is the so-called 'one-wire' system. 'One cable' system would be more accurate, for actually three to six conductors are run in a single cable to all sensors and all actuators of the car. Information and control signals are multiplexed onto this cable in the form of serial pulse code modulation (PCM). While all receivers are exposed to all control signals, only those pulse-coded for a particular receiver can enter it and initiate the desired action. "Before the Automotive Central Processor can effectively communicate with all encode and decode stations throughout the car, two major problems must be overcome: reliable digital transducers must be developed, and suitable 'muscles' for doing the actual work must be worked out and subjugated to the electronic controls. We have good analog transducers, but if a single computer is going to receive and display information from several transducers, that information must be in digital form. Analog-to-digital transducers would add an extra step. At present, there are very few accurate, inexpensive digital transducers. A computer can receive and process information, but it cannot do major physical work. In a car, such work is usually done by electricity, hydraulics, or vacuum power. It would seem hydraulic power possibly generated by the power steering pump, with a fluidics interface between the electronic control and the powered unit would be the best solution. "Cars of the future will still require service, and electronics will perform the diagnostic work. Alpha-1, as already mentioned, does basic troubleshooting with its on-board computer; but a more elaborate system is already in use by Volkswagen. 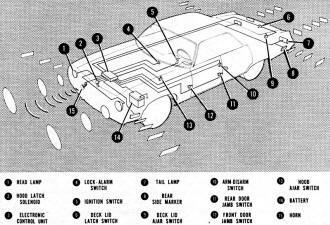 Many sensors located throughout every 1972 and later Volkswagen connect to a socket in the engine compartment. A computer at Volkswagen service stations, when plugged into this socket, rapidly checks 60 vital points including such things as front wheel alignment, compression of each cylinder, dwell angle, ignition performance, generator output, battery water level, and even the condition of the rear window heater. At the same time the computer prints out in plain English what's right and wrong with the car. Other manufacturers are likely to follow this lead." "I'm disappointed," Barney complained. "You've said nothing about a completely automatic car that drives itself at 100 mph while the owner plays bridge with his friends." Experimental Alpha-1 auto, by General Motors, uses a digital instrument panel in front of driver along with the sobriety keyboard located to the right. These are the components that are used in the electronic ignition system proposed by Chrysler. Mac grinned. "Don't forget I grew up in a garage, and I agree with the auto manufacturers that the fully automatic car of the Sunday supplements is many years away. Space engineers who have gone into automobile-engineering have discovered there is one big difference in the two engineering philosophies: cost! In space, if something can be done it must be done. In auto manufacturing, you don't do it unless it's better and at least as cheap. Trevor Jones points out, 'It takes $10,000 just to insert a new part number in the GM system.' "
"Okay," Barney said, laying down his soldering iron, "but electronics can do things better and cheaper. With Uncle Sam holding the double-barreled shotgun of pollution control and energy conservation, and with foreign competition lurking just outside the church door, the marriage between automobiles and electronics is going to take place muy pronto. ".